This great little game is a bundle of fun on the handheld system. The Ace Combat series has been extremely popular on the PS2 and has come over onto the PSP nicely. 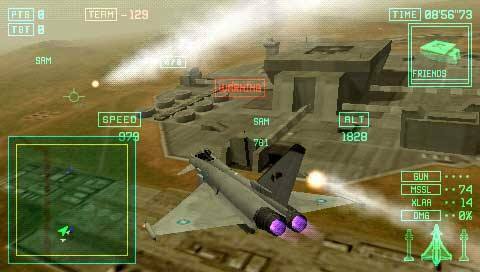 For those who are not familiar with the series, Ace Combat is a flight sim, albeit one with a definite arcade pick up and play feel. 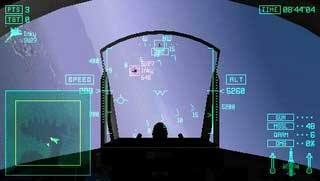 Graphically impressive, Skies of Deception has a whole swag of real life fighter jets just waiting for you to hop in the cockpit and fight the good fight in a future made up war between made up nations. There is an element of fantasy thrown in for good measure with technology that is just over the horizon in terms of becoming a reality. Sometimes it does seem as though science fiction and games is driving the real science and technology race. The control system is pretty intuitive although there is a slight learning curve in getting used to what button makes the fighter perform certain functions. Players will find that they should get the hang of it in fairly short order though. The game will see you taking on airborne foe and also ground forces. As much as I like dogfights, I also get a kick out of blasting stuff on the ground so was well covered either way the game worked out. Another cool thing is that you will get the feeling of being part of an elite team with AI controlled pilots helping you out with a lot of the missions. Don’t rely on them though as the game will make sure that you are accountable for your actions if you relax. As the game progresses you will earn credits that allow you to make mods to your craft and buy newer, bigger and badder ones. It does seem a shame that the people you are fighting for don’t help out with that, but I guess you have to make your own way through the world at some stage. A massive arsenal of airborne fun is there for the taking, at least for those who win their battles. A nice touch is that you can follow your own path with missions diverging from each other so as you can fight the fights that you want to, with about 15 missions in total. Rank is earned throughout the game and missions can get quite tough which will make most gamers really want that brass at the end of an adventure. The audio in this title is great, making you feel truly a part of a bigger experience. You can listen to the radio chatter of other flyers and also be truly impressed by the out of cockpit sounds. Considering the graphics in the game are good, the framerate is not too shabby and audio impressive, this is a game that should please most fans of the genre. Most certainly worth a purchase for all fans of fighter jet titles as it will not disappoint.